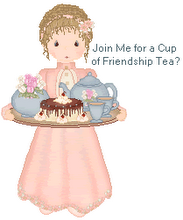 Friendship Tea: Too Many Teacup Trios? about my most recently acquired teacup trio. How many teacup trios do I have? I don't know, and it's not likely I'll ever count them. Some are stored, and others are displayed here, there and everywhere! And, do I have room for more? No, but that probably won't stop me from purchasing more. The teacup trio in the photo above is Crown Staffordshire "Springtime." This was my mother's and the only set she had, long before I knew what a "trio" was. I was able to collect multiples of this pattern from eBay and other sources. It's one of my favorite sets of teacup trios to use when serving afternoon tea. 6 1/4" plates, just a bit larger than the saucer. The Royal Tara trios below are the smaller size. I will show other examples in another post. my hands to pay when the shopkeeper exclaimed I had found trios. in England at church "tabletop" sales and thrift shops everywhere I travel. most of my trios are not the same pattern. in 2015 using twelve Royal Albert "Flower of the Month" sets. This teapot, cream pitcher and sugar bowl are featured on my blog header. matching to set a tables of six or eight. So, how and where do I store and display all these trios? Hmmm, perhaps that is a blog post for the near future. I love it all Linda! Where there's a will - there's a way! Love this post, Linda! Your trios are beautiful. Not too many at all! I enjoyed seeing these beautiful pieces. Beautiful trios! When I see them at the antique mall my hand reaches out for them. Then I must pull my hand back and say no I can't start another collection. So I will admire yours and others beautiful teaware.